Credit: © The Field Museum, D. Quednau. 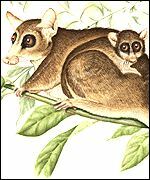 Existing primate species can be divided into six subgroups: lemurs, lorises, tarsiers, New World monkeys, Old World monkeys, and apes and humans. 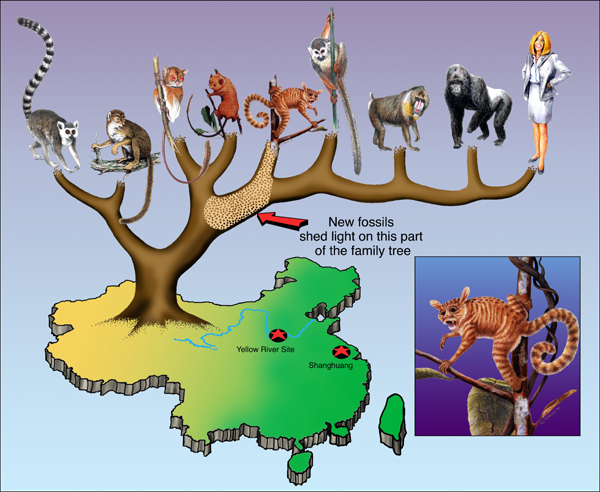 As reported in an article in the well-respected scientific magazine "Nature" in April, 2002 the results of researches led by the Field Museum of Chicago have resulted in a revision of the evolutionary tree for primates. The early origin of primates has been pushed back from 65 million years ago to 85 million years ago, before the dinosaurs became extinct. According to Dr. Martin vice president of academic affairs at The Field Museum and co-author of the research, who has studied primate evolution from many different perspectives for the past 30 years, their 85-million-year-old early common ancestor of the primates probably looked like a primitive, small-brained version of today's dwarf lemur. That animal would probably have been a nocturnal, tree-living creature weighing about 1-2 pounds, with grasping hands and feet, also used by the infant to cling to the mother's fur. It probably had large forward-facing eyes for stereovision and a shortened snout. It would have inhabited tropical/subtropical forests, feeding on a mixed diet composed mainly of fruit and insects. Like humans, it probably had a slow pace of breeding characterized by heavy investment in a relatively small number of offspring. The illustration above left was prepared by Nancy Klaud to accompany the Field Museum's research findings. From time to time new fossils are discovered which seem to offer a greater insight into very early primates which may have featured in the evolutionary origin of mankind. 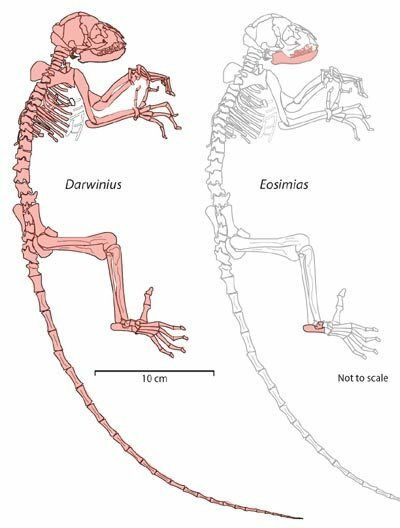 Two of the more accepted 'very early primates' being known to science as Eosimias, (which translates as Dawn Monkey), and Darwinius Masillae. Eosimias seems to have lived all of forty-five million years ago and Darwinius Masillae all of forty-seven million years ago. The discovery, in China, of some fossilised foot-bones believed to be from Eosimias, an early species already known of from fossilised jawbones, led to the announcement, in 2000 A.D., of Eosimias as a candidate for consideration as an early ancestor present in the family tree of humans / primates. A graphic was subsequently published showing where the researchers would place Eosimias in relation to the origin of mankind. From left to right the primate species depicted on the tree are: a lemur (Lemur catta), an adapid (Hoanghonius stehlini), a tarsier (Tarsius bancanus), an omomyid (Shoshonius cooperi), a proto-monkey (Eosimias centennicus), a South American monkey (Saimiri sciureus), an Old World monkey (Mandrillus sphinx), a great ape (Gorilla gorilla), and a human (Homo sapiens). As recently as May, 2009, another fossil discovery - that of the Darwinius Masillae / Ida fossil - was triumphantly announced, at a high-profile media launch hosted by the prestigious American Museum of Natural History in New York, as a possible early ancestor in terms of the primates family tree. This fossil, of creature beleved to be of an early adapid and seeming to bear both lemur-like and monkey-like traits, dating from some 47 Million years ago, had been discovered in Germany's famous Messel Pit where many astonishingly well preserved fossils of diverse early species have also been unearthed. It very soon emerged, however, that the placing of the Darwinius Masillae / Ida fossil in relation to the human evolution was open to dispute. Whereas the research team directly involved seemed to give Darwinius Masillae / Ida a definite candidacy as a potential great-great-great-greatn aunt of Human Beings other prominent researchers, - including one Dr. Christopher Beard who had been closely involved in the Eosimias foot-bones study and who was, as of May, 2009, curator of vertebrate paleontology at Pittsburg's Carnegie Museum of Natural History, - saw Darwinius Masillae as being only distantly related in terms of the primate family tree, human evolution the origins of mankind. There are many un-knowns in relation to early primates and their evolution. At age-of-the-sage we are more truly interested in the origins of Human Psychology and Spirituality than in the origins of Human Physique.